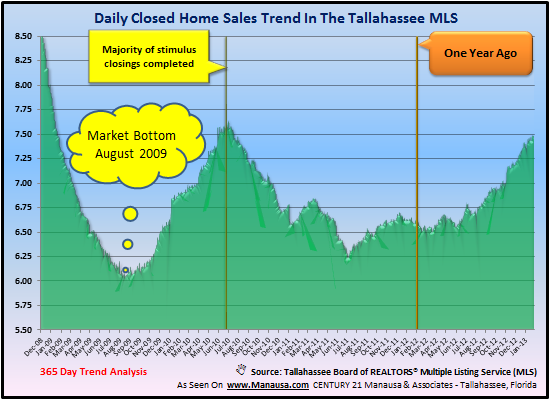 Ask anybody who sells real estate in Tallahassee how the market is doing and they will tell you it is hot! As anecdotal evidence that our housing market is on fire, Joe Manausa Real Estate has added two new associates in the past 30 days, and our sales thus far in January exceeds our production from January and February of last year combined. But as exciting as these results are to experience, I still keep tracking multiple trends for real estate in Tallahassee in order to provide the best guidance possible. Currently, we are seeing some conflicting trends. Just ask Robin Jerkins, a sales associate at Joe Manausa Real Estate, and she'll tell you she's never been so busy. And she means it! And why is Robin's opinion significant? Because she is one of our two new agents. She moved to our office with limited Tallahassee experience, but she brought over 15 years of service as a REALTOR in Maryland. So what does Robin mean when she says she has never been so busy? In her first month with our office, Robin has averaged more than 1 appointment per day and she has already written 4 contracts and has several other offers in negotiation. Considering the average agent selling real estate in Tallahassee last year closed only four contracts (for the entire year), I would say Robin is busy! In the real estate graph below, we record the average number of homes sold each day in Tallahassee. By using a 365 day average, we remove any effects of the seasonal changes that occur throughout the year, making this a very important Tallahassee real estate report. Currently, the number of closed home sales is on a rise, and it appears to be about to hit a four year high. So our graph of the sale of real estate in Tallahassee appears to support our anecdotal evidence of a "market on fire," but we get a conflicting report when we study new contracts (pending home sales). The Pending Home Sales graph shows that we are experiencing a declining trend in the number of new contracts recorded in the Tallahassee MLS. This means one of two things. 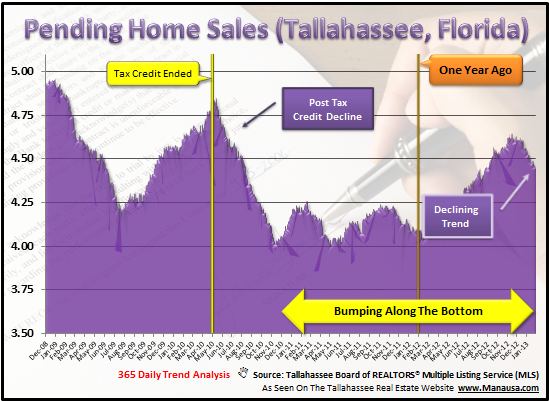 Either we will start to see a decline in the closed real estate in Tallahassee, or we are seeing a new behavior among real estate agents in the Multiple Listing Service. Perhaps fewer contracts are being changed to "Pending" even though they are slated for a closing. If the latter were true, it would explain how the sale of real estate in Tallahassee could be "on fire," even as the buyer activity appeared to be cooling. Whether you are looking to sell a home in Tallahassee or buy a home in Tallahassee, we would love to help. Even if you are six or more months away from starting your move, please drop me a note and we can put you on the path to success. Whatever you plans for real estate in Tallahassee, we would love to help you. Hi Joe - Is it a possibility that homes are staying in "pending" status for shorter period of time due to it being easier to get a loan or easier to process sales for short sales/REOs? So where a home might have been pending for two months in 2012, now its only pending for one month. Dike, actually the contrary is true for your two situations. It takes longer to close a loan (due to new government regulations with lender disclosures) and short sales average well over four months to close. I think the issue is that Realtors just aren't using the pending status with short sales, so a short sale that is truly pending for four months goes from Contingent to closed.